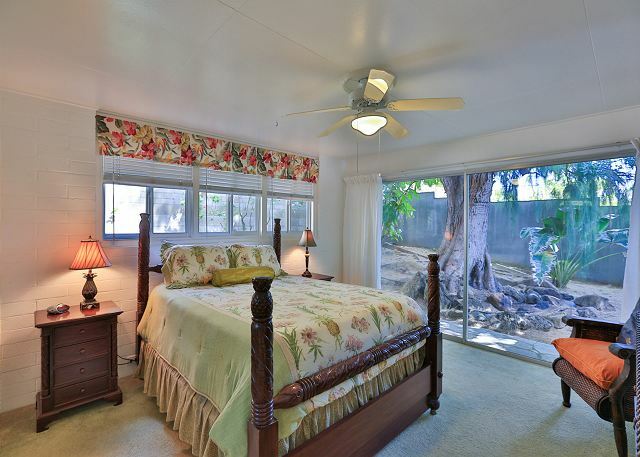 1st Floor 2nd bedroom features a queen bed and outside lanai located in hallway. 1st Floor 3rd bedroom has twin beds and located at beginning of hallway. 2nd floor Master Bedroom with king bed. You have found The Star of Hawaii in beautiful Kailua, Oahu, Hawaii. 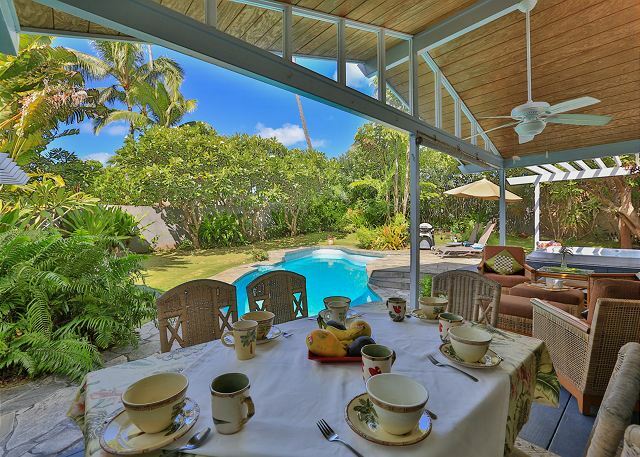 This walled and private residence is on a charming beachside lane in a great Kailua Beach location. The setting offers relaxation from a hurried world. The gardens, pool is encircled with lava rock walls. Relax around the pool or walk barefoot to the beach. Be our guests and let worries melt away as you take sunrise swims and sunset walks along this soft white sand beach. Surrounded by tall palms and flowering plants, Hawaii embraces you. 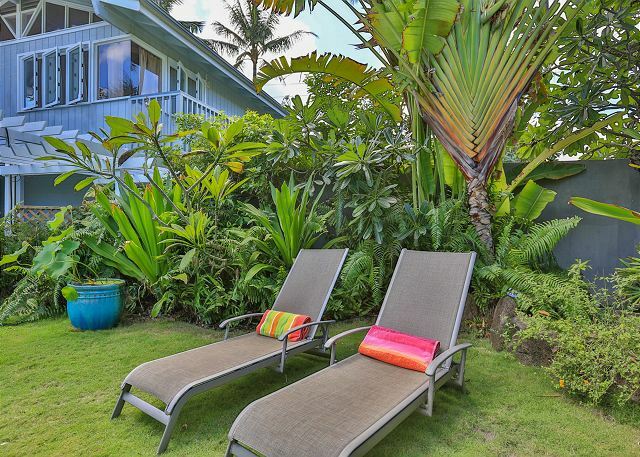 A few steps down the lane takes you to a peaceful and secluded stretch of world-famous Kailua Beach. You will have the amenities for a perfect vacation when you walk through the garden gate. 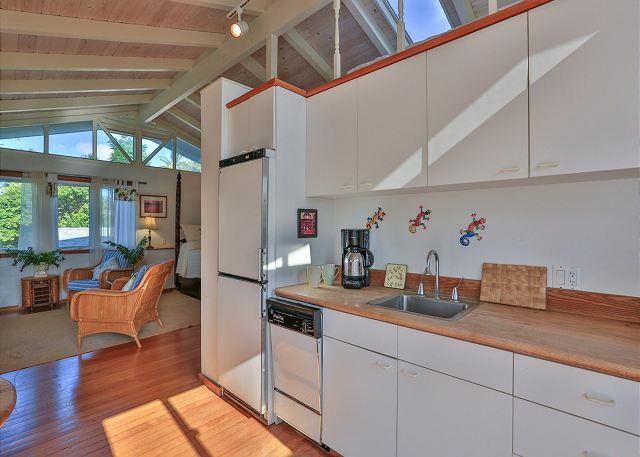 This 4B/3B home offers an opportunity for separate entertainment and sleeping areas. 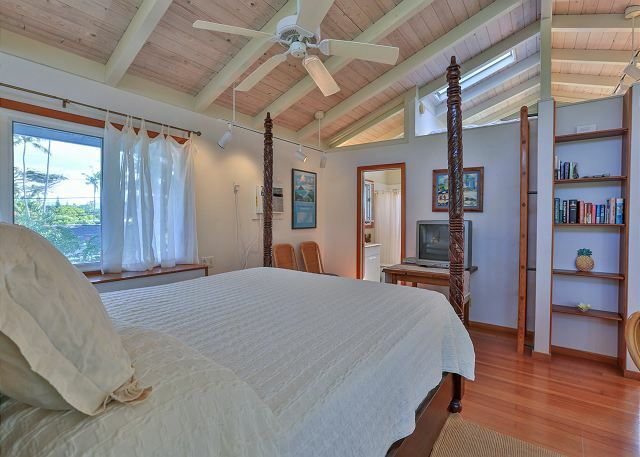 The main level has 3B/2B with queen bed in master bedroom and air conditioning. 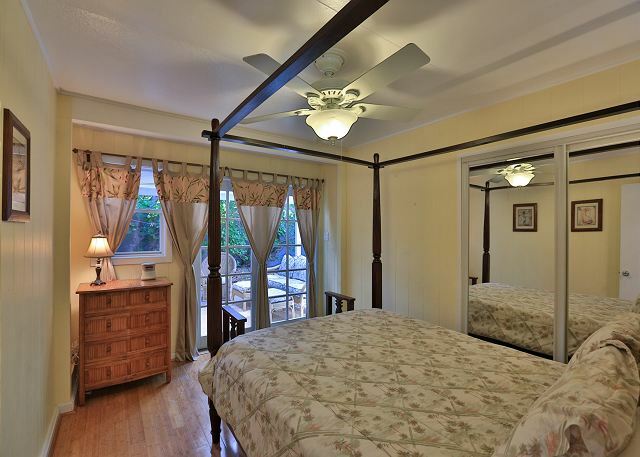 The second bedroom has a queen bed and the third bedroom has twin beds. The living room has a sofa sleeper for 2 and is air conditioned. Upstairs is a large 580sf guest suite, air conditioning, with a King Bed, another sofa sleeper for 2, bath, kitchenette and sitting area for TV, reading or games. This design offers couples and families privacy and flexibility. 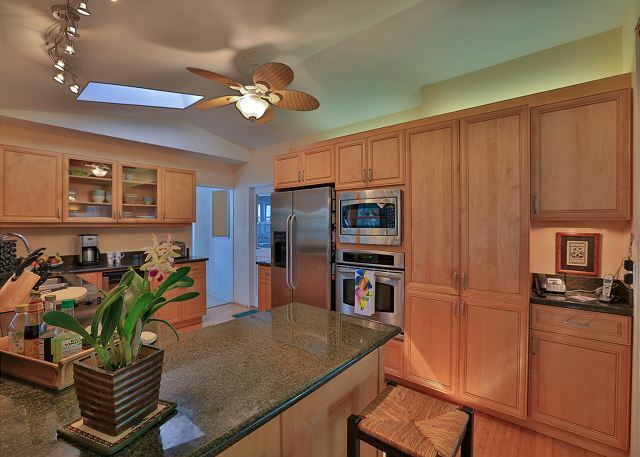 The house has a fully equipped gourmet kitchen and family sized dining room. Living spaces open to pool and gardens. 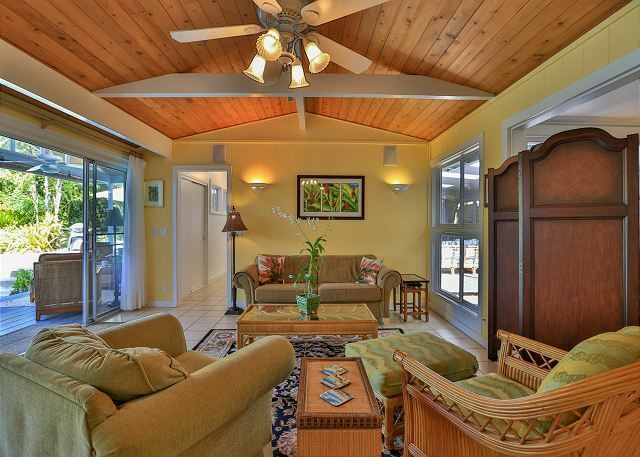 The house has that "Hawaiiana" feeling of bringing the outside in. The grounds of this elegant home will leave you dreaming of your next visit. We have provided a lei making basket complete with easy instructions and supplies; you are encouraged to pick flowers and string your own Hawaiian leis. Welcome to the islands and our home. 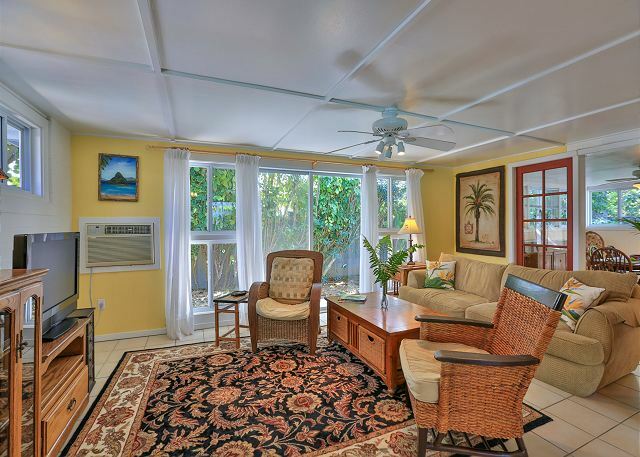 Very nice and comfortable home, Easy to get around in Kailua. great pool and hot tub for the kids. Close to the beach. Kepola was special, she took very good care of our needs. We celebrated my mom’s 80th birthday at the Star of Hawaii. A very easy home to have friends and guests stop by. Our family of ten ranged in age from 6 to 59 years old! 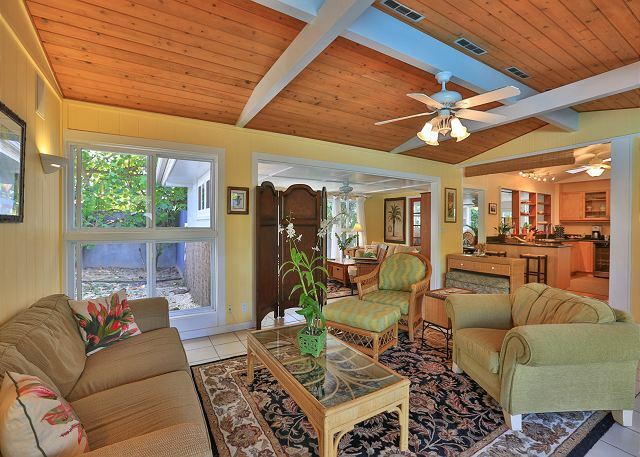 Everyone loved the location of the Kailua home being four houses from the spectacular beach. The home was perfect with two living areas with six of us in the main house and four in the upstairs unit. There were plenty of sitting areas inside and out plus by the swimming pool! The property management team communicated several times before we arrived plus met us for check in. We highly recommend this rental property and hope to return soon! Great place to vacation for 8 adults & 4 children. We had an amazing time. The kitchen was up to date with everything you will need. It was very roomy & comfortable. It was very clean. Short walk to the private beach. When we weren’t at the beach, we were in the pool. We made good use of the pool & beach toys that were there for our use. The attention from the property manager was amazing. He was easy to reach. He made sure that the kitchen had necessities and all the cooking items anyone would need. The home was clean and spacious. We chose this rental house for the family to stay in as we celebrated my husband's mother's 70th birthday. His mom and dad stayed in the upstairs unit...was perfect for their own privacy. We had cool weather the first half of the trip so the hot tub and the pool were perfect distractions. Hot tub was a bit dated, but the house was very comfortable and kitchen was well equipped. Kepola and Kawika were excellent in responding to us throughout our stay. The house was amazing! Love the ease of getting to it from the airport. The pool was awesome, although the weather was a little cool during our stay so the water was too. Hot tube needed to be cleaned due to sand in the bottom, but once that was done it was used regularly. The beach was literally a 2 minute walk if that from the house. I totally suggest waking early and walking down to watch the sun rise...such a majestic experience. Lots of room for a large family. The upstairs apartment was great so that the boys and girls could be separate...eliminates squabbles over the bathroom.. I will tell you that if you are planning on ordering groceries from the local grocery, do not allow substitutions...you never know what you will get...ask for creamy peanut butter...you get extra crunchy....ask for 2% milk you get almond milk...just saying. Except for that one hiccup...We are counting the days till we can plan another vacation and stay at the Star of Hawaii... The Management company was awesome...met us at the property and was available for questions or issues. Thank you guys for a wonderful Hawaii experience in a beautiful home and amazing beach! Aloha! Our family was very comfortable here. The pool and hot tub were a hit. We had a large family gathering and the property worked well for us. The location was great and the amenities were exactly what we hoped for. Really a great place! We (7 adults and 4 children) stayed for 16 days and we all loved the place! Its really close to the beach and the garage was filled with everything you need for a day on the beach including kayaks and Surfboards! Kalapawai market is only about a 10 min walk on the beach which was great for our morning coffee. Smooth check-in and check-out and when we had some questions, Kepola always gave us prompt answers. Recommend this place! This place truly feels like a home away from home. If we make it back to Kailua, we will definitely stay here again. It was the perfect layout for our multi generational group. Beautiful home allowed for some wonderful family fun. Had a great stay at the Star of Hawaii. 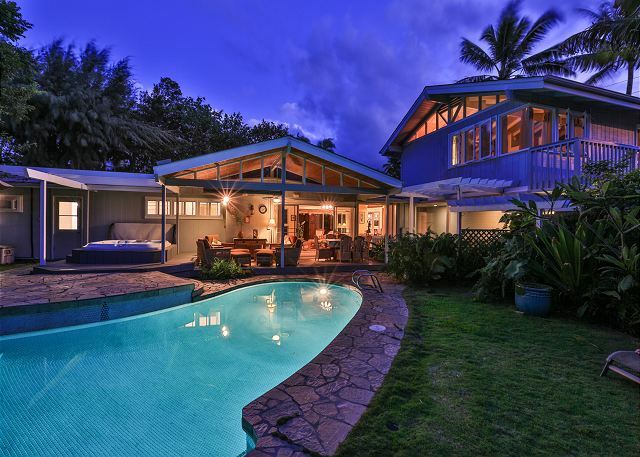 Beautiful layout with close access to the best beach on Oahu. Fantastic house for multiple families. 3 families from Canada escaping the cold weather. House was large with a great layout. We had the youngest kids (up earliest) and could get up and have breakfast and watch tv without disturbing anyone. Pool and hot tub were great, kids were in a lot while parents lounged beside. Beach 1 minute walk away, garage was full of beach toys, chairs, boogy boards, surf boards, kayaks, life jackets and more. House was in great shape, furnished well, clean and had all the towels and bedding we needed. Really appreciated being able to cook and having laundry. Easy to book, get to, check in, and everyone we dealt with was great. Enjoyed Kailua and the spectacular beach. Definitely a lot of memories made here. Will be back as soon as we can! There were 7 of us and the house was perfect for our 3 generations. The pool is not heated and overcast skies so too cold to swim. The beautiful beach is a short 2 minute walk. We enjoyed our week staying in Star of Hawaii that was well stocked. Kepola was very helpful with the arrangements and information before our arrival. The house was exactly what we were looking for. The house was very clean and kitchen well equipped and had a beautiful pool. The air-conditioning in the main living area was adequate, but was great in the two bedrooms that had their own unit. 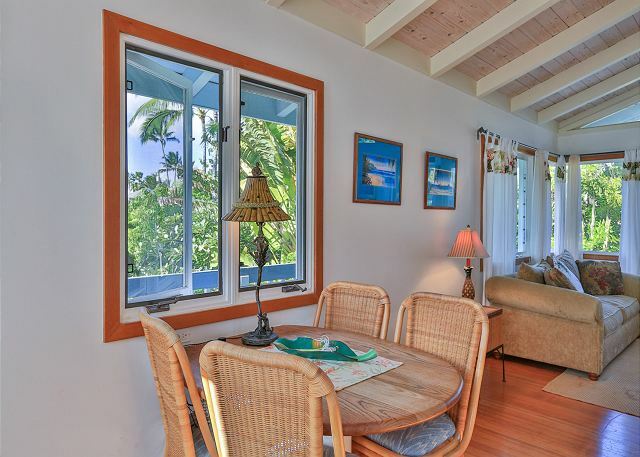 Very close both to the beach and Kailua town. We had a fabulous time. The convenience of our own pool and beach access within walking distance was so nice. Perfect location and home for our family vacation. When then grandkids were not at the beach, they were in the pool. Would suggest a reduction in the amount of chlorine in the pool and also a TV in the master bedroom. Otherwise, it is a well equipped place - very clean and well kept. Wonderful Family Christmas at the Star of Hawaii! We stayed in the studio over the garage and enjoyed having a space somewhat separate from the rest of the family :-). They stayed up later watching movies and playing monopoly! Everyone had a great time and thought the house was just perfect. Shane was most accommodating when we accidentally broke a lawn chair, replacing it the same day. He also fixed the glass slider within hours of it coming loose from the frame. This is an older home, but we found it very comfortable and would definitely stay there again if the opportunity arose. Our Dream Vacation…….a house so comfortable and clean, a great location, and the most beautiful beach nearby! Shopping and restaurants so accessible, too. The age range of our party was 12 to 74 and all agreed it was a fantastic choice. We never dreamed it would be so perfect, and perfect it was!!! Kudos to the most professional and friendliest management company! Reservation was easily made and check in and out even easier. Truly a gem of a place!!!! This location was great and the property manager was very responsive and friendly. The home was clean and fairly well equipped. The beach was wonderful and felt very private with the exception of Saturday. There are some basic things the owner could invest a little bit of time and money in that would take this home from good to great. While the kitchen is for the most part very well equipped, there are no containers with lids for left overs. Just a bunch of mismatched items. In addition,instructional notes on house features would have been helpful. An example - we could not figure out how to turn the television on in the guest suite. In addition, the cleaners must have left the refrigerator door open for hours to clean it. It took 11 hours for us to get the temperature down to a standard 40 degrees and we feared our large amount of food we purchased for the entire week could be spoiled. Finally the owners should invest in a second set of trash cans. They were FULL when we arrived, while the property manager was kind enough to respond to this problem, the owner should rectify this. Finally, if you are considering this for the July 4th week, the fireworks over the ocean were great and the small town Kailua parade was charming. Beware though, all the people that come to these events will use your trash can, again creating no room for your trash. Two grandparents, three adult kids and two grandchildren had a wonderful week. The house suited us perfectly and the beach was a short stroll away. We had a great time going back and forth from the beach to the pool. We love that stretch of beach and the uncrowded nature. The home was well equipped with everything we needed - beach toys for the little ones included. A good time was had by all. Place for friends. 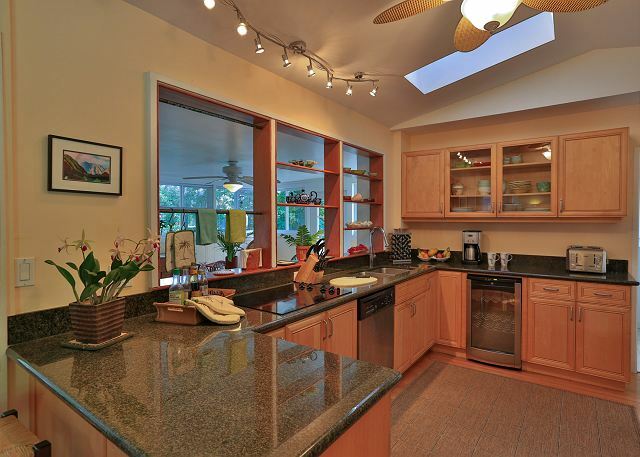 We enjoyed the many siting areas -inside and out- that it offers, It has a fabulous location, kitchen, pool, and javozzi. I like the upstairs apartment and was wonderful for our family! The manager was great And easy to contact. She addressed questions or concerns quickly. Thanks Kapola! A very nice place to relax and enjoy. the house is open and comfortable. Family type comfort. Everyone could find their space for enjoying what ever they felt like doing. My family loved being there and made their vacation memorable. I would not hesitate coming back. Thanks for the memory!!!!! We were at this house about 4 years ago, and such a treat to be back. It is comfortable, beautifully appointed, clean and such a pleasure to deal with the managers. We shall definitely be back...again! My first impression was a little disappointment because the property is a little dated, but it didn't take long to quickly feel very comfortable and appreciate the qualities of the property. There were 10 of us, including our grandchildren who are 12, 6, 5 and 2-1/2 months. The property managers were very helpful and responsive to our needs, i.e., bringing two Pak 'n Plays so we could lay the baby down upstairs and downstairs. Also, they came immediately to fix the exterior spotlight so that the family that slept upstairs could see at night. Everyone loved the pool, spa, lanai and access to the beach. The kitchen was more than amply supplied for our needs. We spent a lot of time in Honolulu so it was nice to return to a nice quiet comfortable "home". We wish we could have stayed a few days longer so that we could have enjoyed more time on the beach. The only thing I didn't like was that the window coverings don't cover the windows. The house was perfect. Living space above the garage was perfect for our son and wife who have a 10 month old. Older grandchildren loved the pool and the beach access - as did the adults. Nice location for a relaxing, quiet vacation. The goggles and pool and beach toys and chairs, etc. were a real perk. Everything was there that we needed for making meals and snacks. Would definitely stay there again. Our son was married in Hawaii and we had the perfect home to stay in with our family. Everything was set up for making us feel comfortable and at home. We all loved exploring the many porches and rooms of this lovely home. The pool was especially beautiful at night. We have never seen the ocean and beach look prettier than at this location. Thank you to the hosts that we talked to by phone and who greeted us upon our arrival. They were very helpful and friendly.This made planning our trip easier form nearly 6,000 miles away! The only reason I did not give this property a 5 star rating is the fact that the previous people did not leave on time not giving the cleaners time to thoroughly clean the house. Had the cleaners had time to do their job, I would not be able to say one bad thing. Renting this house, in this location, with a pool, right down from the beach was a perfect way to vacation! If the kids weren't in the beach they were in the pool. It was much better than staying in a hotel/resort. Absolutely love the property!!! Great place to spend some quality family time!! Can't wait for my next holidays!!! The Star of Hawaii welcomed us with everything we needed! What a sweet home... We especially loved the outdoor area with its spotless hottub and pool, bbq, sitting area and outdoor shower all surrounded by the smell of lovely local flowers and the sound of birds. The house was very comfortable and nicely laid out with the upstairs 2nd master bedroom with loft and pullout couch which is great for families with small children. Beds were very comfortable with soft linens and good mattresses. This home has two sets of washer and dryers which comes in extremely handy when laundering beach towels consistently! Loved the location with the Kalapawai Market down the street and a two minute drive to coffee, restaurants, and shopping. The 60 second walk to the private entrance to Kailua Beach was definately the highlight. Very quiet, breathtaking beach access any time of the day or night. Our families grabbed kayaks, beach chairs, beach toys, coolers and snorkel gear all provided by the Star of Hawaii and had many hours of effortless fun on Kailua Beach. Kepola was our agent for the house who was very helpful, accommodating and prompt. Thank you for the wonderful stay! We had friends with us and it worked out perfectly to have them in the upstairs unit. We learned that next time we will want a house right on the beach. There is a gate that you have to have a key to get to the beach and to get back from the beach. That was a little bit of a hassle with five children needing to go back and forth to the bathroom. Other than that the home fit our needs perfectly. Great pool and hot tub. Lots of indoor and outdoor seating. The Star of Hawaii was an excellent choice for me and 6 friends. The location was excellent, the beach was at the end of the block and Waikiki Beach was about 45 minutes away. The house was clean and had whatever we needed including a cooler to take to Hanauma Bay. I would stay at this location again and recommend it to others. The Booking Agent responded to all requests immediately.